Dimensions: 192L x 17W x 13.5H in. Snow may be very beautiful, but it is also a problem. When it lies on the ground, in your driveway or on paths, it needs to be cleared so that pedestrians and vehicles can get through easily. Bigger problems can occur, however, when snow settles in thickness on your roof. The simple fact is that snow is heavy. Even a couple of inches of snow covering a roof can cause damage. Any more than that, and things can get very serious – as well as very costly. When It begins to melt, snow on a roof will find all the cracks and crevices it can and will cause any minor gaps to become bigger ones. The Avanche snow roof rake ranked #1 in our top 10 best snow roof rake reviews and for good reason, the Avalanche Roof Rake System is very cleverly designed. Let’s have a look at it in more detail, and tell you why we think it is a cut above the competition. What is the Avalanche Roof Rake? First, let us say that the Avalanche Snow Removal System is not simply a rake, and it comes in two different specifications. There are also accessories for it, which we will cover later on. Whereas a conventional rake you would simply reach up and drag the snow from the roof, this system – for which a rake is available – works in a rather different fashion. The differences are notable: the initial one is that whereas your rake would lead to the snow simply tumbling over the edge of the roof, this system does it in a much neater fashion. The second difference is that the rake does not have a blade as such – the wide scoop-type blades you usually see with snow roof rakes – but a cleverly designed cutting tool at the end of the reach. Are you with us so far? The cutting tool literally cuts away a block of snow which, with a little downward movement, is then directed down a chute that is attached to the tool. Because the snow is directed down the chute, you know where it is going to end up, so no chance of you getting covered in snow while clearing! This video gives you a clearer idea of what it is all about, and why it is the most effective tool for clearing snow from roofs. Let’s look in a little more detail at the benefits of the Avalanche Roof Snow Removal System. Clearing snow from the roof is one of the least enjoyable jobs of the winter. Unfortunately, in areas where snowfall is regular, it’s also a necessary and regular one, and very hard work. 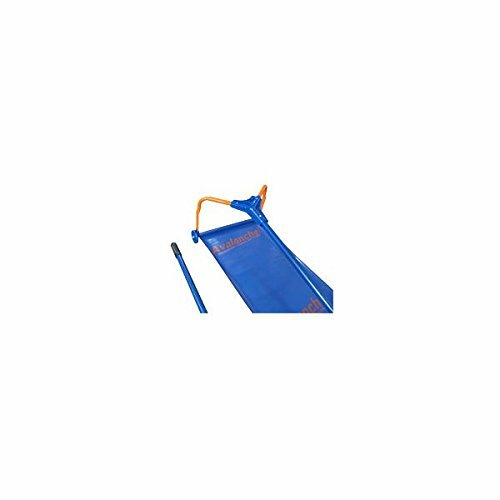 The Avalanche System makes things a lot easier, and if you get the technique sorted – and it really is not difficult – you will find it not only less stressful and strenuous than using a standard rake, but also much faster. In fact, you can remove as much as one ton of snow every minute if you use it correctly – that’s a lot of snow! The Avalanche Roof Snow Removal System comes in two varieties: the 500, and the 750. Both are very similar, but are designed for different types of roof. The 500 System comes with 1.5inch wheels which make it ideal for shingle roofs (the wheels enable the movement of the blade and the snow without dragging a solid object on the roof tiles) while the 750 can handle tile, metal, shake and even solar roofs, and comes with 3inch wheels to give greater clearance. The device consists of the blade/cutter, an extendable handle pole made from fibreglass for light weight and guaranteed strength, and the all-important chute, which attaches to the framework and catches the snow. If this sounds complex, it’s not; it is actually a very simple system that someone has taken a lot of time to get right, and it works. The instructions for putting the three elements together are simple to follow, and it is all done by very simple snap-together methods so the item can be disassembled when not in use and stored away easily. When it comes to accessories, you will find that you can get just about everything you need to ensure you get your roof cleared effectively, including the Avalanche Roof Rake, which works well with the Removal System. The rake is a simple yet effective design that is similar to many other roof rakes, yet of a superior quality as you would expect from Avalanche products. It features a 20-foot long handle in five sections, so you can set it to your chosen length at five-foot intervals, and a sturdy and well-made blade with a 24-inch clearance width, designed to work with the full system. It also has small wheels for clearance, is very light to handle, and has a handy wall-mounting so you can store it away easily. Used together, the Avalanche Roof Snow Removal System and accompanying Roof Snow Rake are an excellent way to clear snow from most roofs, and the range of replacement parts means you will get a long life from the product, no matter how often you use it. Do you need the Avalanche Roof Snow Removal System? As we said earlier, clearing snow from your roof is a job none of us want to do, as it is cold, wet and hard work, but it is also essential, so anything that makes it as easy as possible is certainly welcome. The Avalanche Roof Snow Removal System is an excellent set of tools that can clear a ton of snow in a minute, is easy to use and will give you many years of service, and if you use it with the accompanying rake, then you really can’t go wrong. As for cost, there may be many cheap and cheerful roof snow rakes that undercut this by a long way, but none will give you the efficiency of the Avalanche Roof Snow Removal System, so we recommend you take a closer look and make your life easier during those cold winter months. If however you need to clear more than just your roof, you probably need a snow blower or electric snow shovel instead. Be sure to check out the rest of our site for some of the best reviews on the web.